We recently completed work with The Wilderness Society, the Alpine Lakes Protection Society, and Congressman Dave Reichert's office to map proposed additions to the Alpine Lakes Wilderness Area. The proposal also includes the designation of the Pratt River as a wild river. One of the CORE GIS maps produced in this effort is featured in the photo of Congressman Reichert announcing the legislation. Hopefully this bill will get signed into law! I am currently working on a project for The Trust for Public Land in the North Coast of Oregon, part of which involves an analysis of development patterns and trends. In working up numbers for population and housing units, I came upon an excellent source for historic U.S. Census data, the National Historical Geographic Information System. They provide access to the complete Census database for all of the decennial censuses back to 1970, as well as geographic boundary files for mapping the data. So far it has proven to be quite a goldmine! 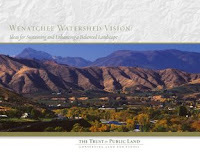 The Trust for Public Land recently released the Wenatchee Watershed Vision. According to the website, this document "lays out a bold vision - one that will require broad coalitions, strategic partnerships, and community initiative to be successful. TPL hopes the Wenatchee Watershed Vision will inspire community action to protect the special places and character of a landscape so many people love." The GIS analysis for this project was started at CommEn Space and finished at CORE GIS. We also did the report layout and graphic design, which was a fun and slightly different challenge. The report and the maps produced for the report can both be downloaded here. CORE GIS recently completed work on a series of maps and analyses of Measure 37 Claims in Oregon. There is a map of the Portland Metro Region, the Central Willamette, Hood River and Wasco Counties, and the Hood River Valley. Eric de Place has some excellent analysis and commentary on the numbers we generated for Sightline. CORE GIS is nearly a year old! CORE GIS will be a year old as of November 1st. I've decided to start a blog here on the CORE GIS web site, to share interesting news items and useful information. I'm using Wordpress, and will be experimenting with the features and layout over the next several weeks.